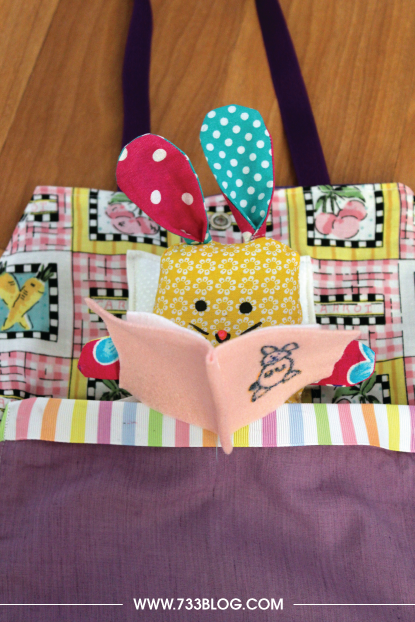 Yesterday I shared how to make my sweet little Scrap Fabric Bunny. 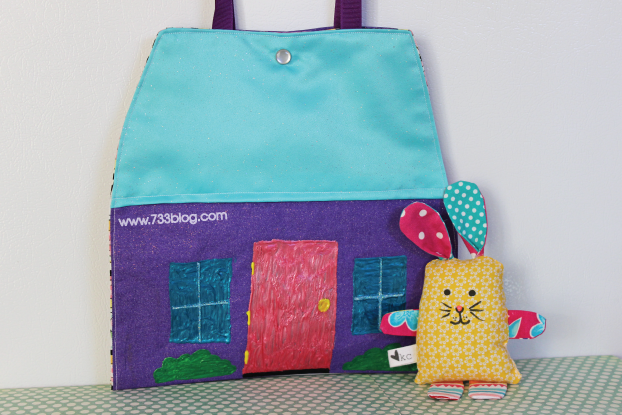 Today I’m going to show you how to make her House/Carry Case that includes a bed and some fun accessories. The first step is to cut out the house shape. You need two of these – one for the outside of the house and one for the inside. Next, cut out a rectangle that will eventually be the roof. It needs to be the same width as the house and you choose the height – mine is 11.75″ wide x 8″ tall. 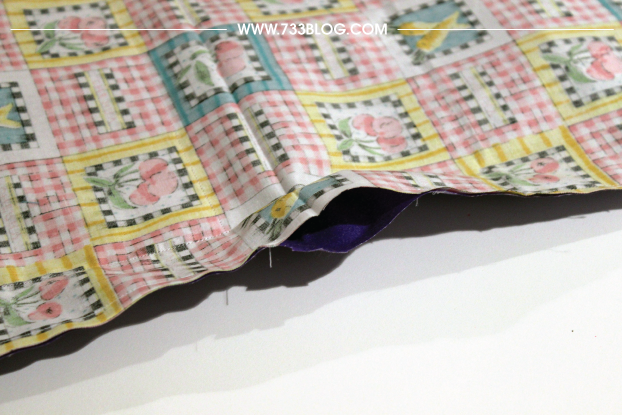 Fold one of the long edges over .5″ and iron flat, line the unfolded part up with the top of the house and sew along the folded section using a 1/4″ seam onto the front of the house.If you want the back side of the bag to have a roof, do the same thing for the other side. 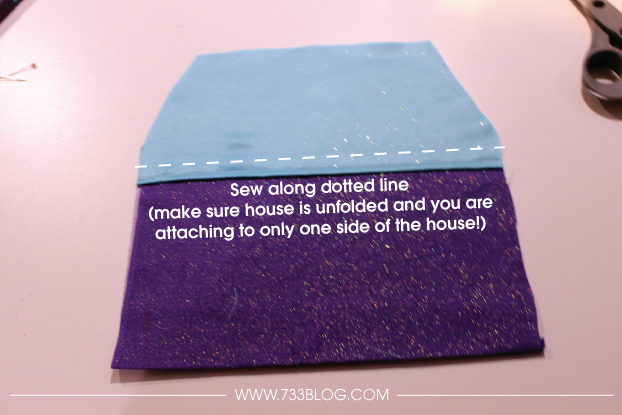 Trim the excess fabric to match up to the house shape and set aside. if you are sewing them on. 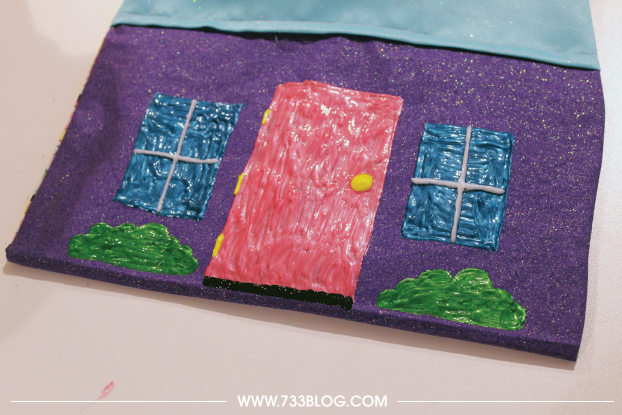 For this tutorial, I used fabric paint for the front of my house and we will do that step later. Now let’s work on the inside of the house. 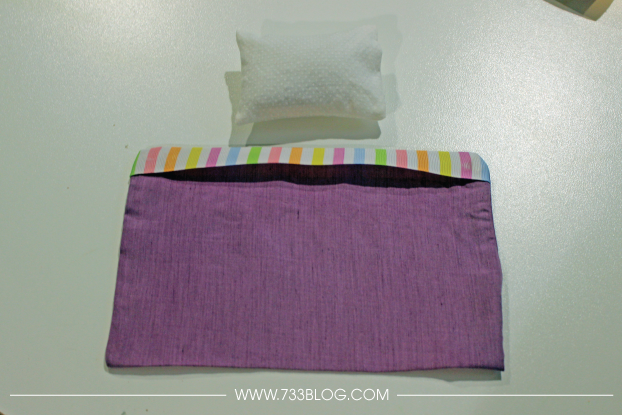 PILLOW: cut out two 3.5 x 2.5 rectangles and sew all the way around, leaving a small hole for turning. Turn right side out. LIGHTLY stuff the pillow and set aside. 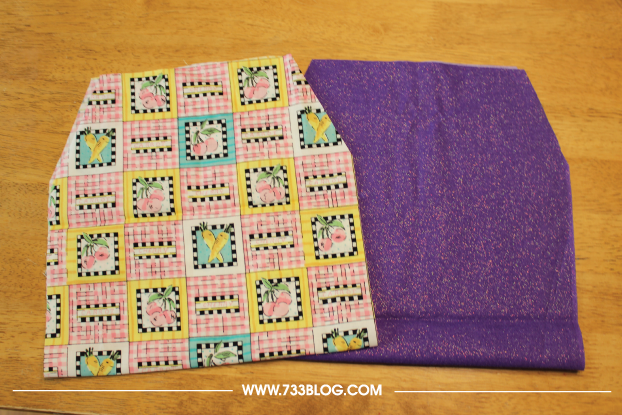 BLANKET: cut out two 8″ x 6″ rectangles, sew all the way around, leaving a small hole for turning. Turn right side out and press edges with an iron. 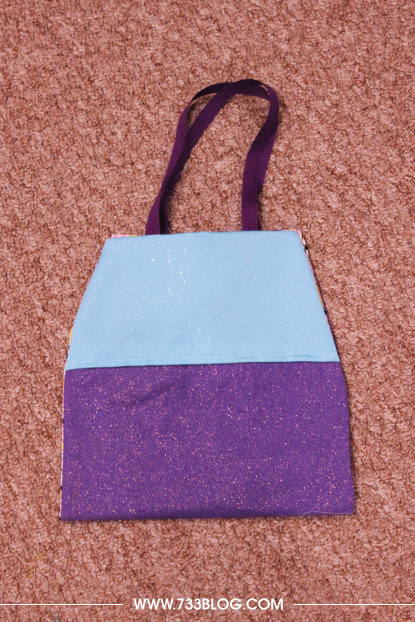 Optional: I added a ribbon along one long edge as an embellishment – I sandwiched it in between the two layers before sewing around the edges and turning. Now it’s time to attach the pillow and blanket. 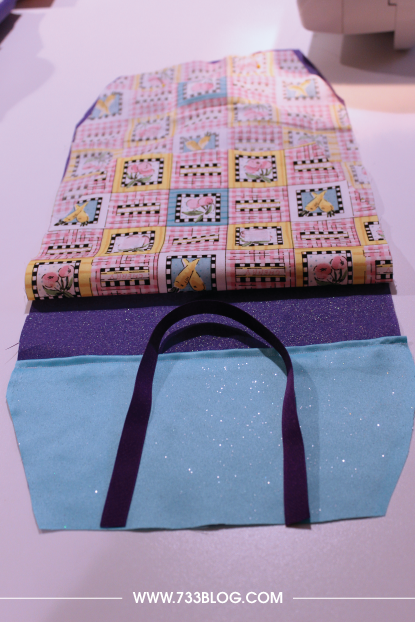 Starting with the blanket, place it about 1″ from the middle fold of the bag, making sure it is centered. Starting at the top side corner, sew down the side, along the bottom and up the other side. 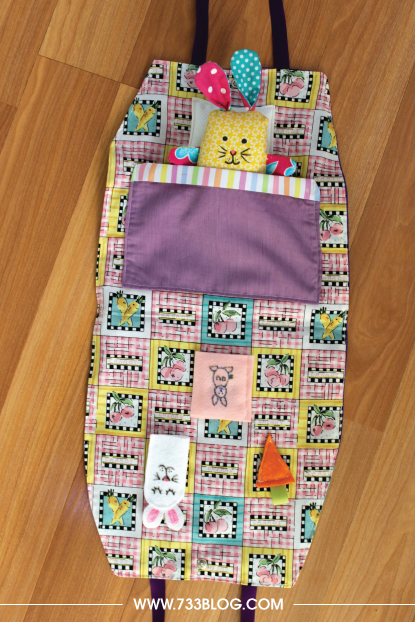 Leave the top unsewn – now you have a pocket/bed for bunny. 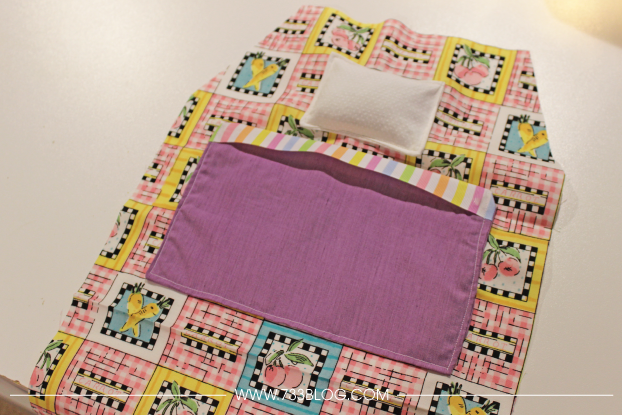 Place the pillow .5″ above the blanket, making sure it is centered. Sew around the entire pillow. The next step is to add velcro for the accessories. Cut three .5″ pieces of velro – the rougher side. Pick where you want them to be on the other side of the “room”. I usually put two on top and one in the middle on the bottom. Sew into place. CARROT: Cut out two triangles from felt. Cut a 2″ piece of ribbon, fold in half, sandwich in between the flat edge of the two triangles. 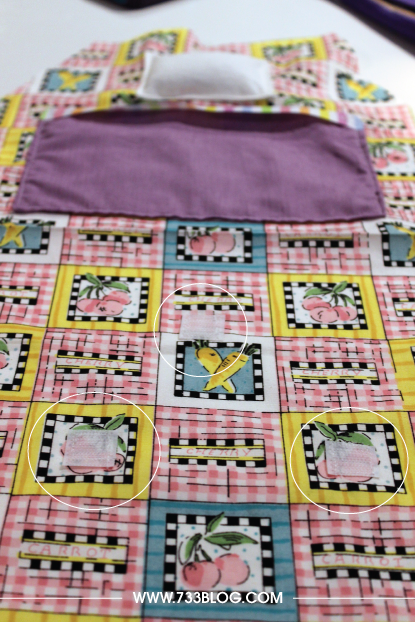 Sew around the entire carrot with a 1/4″ seam. BUNNY FINGER PUPPET: Cut a rounded top rectangle – about 1.5″ wide x 2.5″ tall. Cut out a heart shape for the ears. Sandwich the ears between the two body pieces and sew along the side, top and other side, leaving the bottom open. I used Fabric Sharpies to draw on a face. 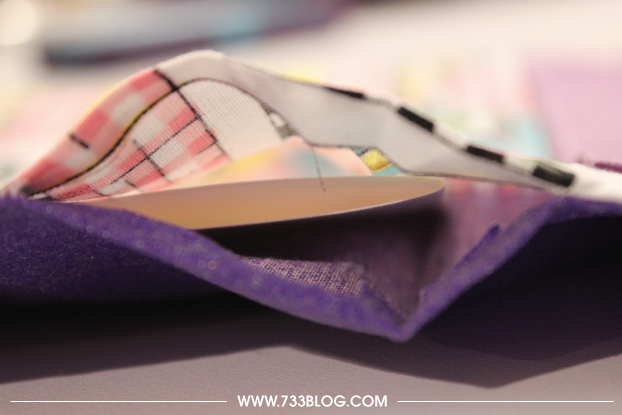 BOOK: Cut a 5″x 2.5″ rectangle of felt, fold in half. Cut two pieces of white felt to fit inside the book. Sandwich everything together and sew along the spine of the book. Since these are all felt pieces they will stick to the velcro you already sewed in place. Now it is time to put the house together. Grab the outside piece and lay it right side up. Cut two 8″ pieces of ribbon — I went with .5″ width ribbon. 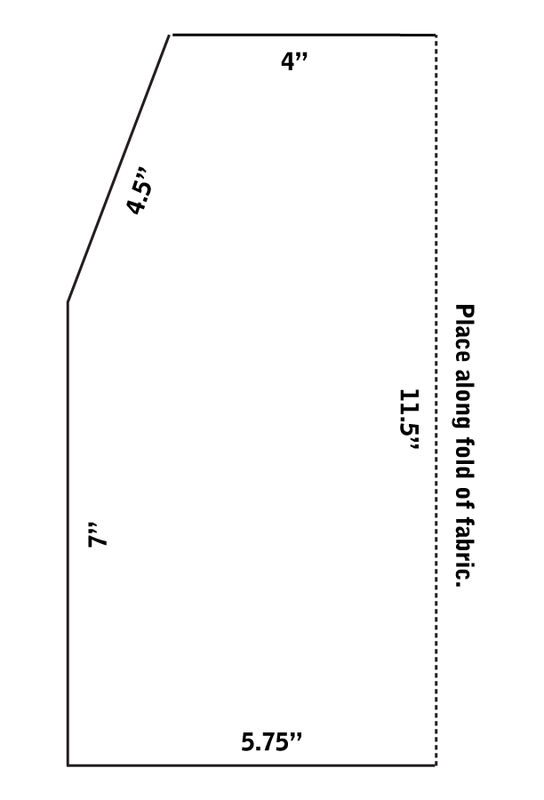 Lay each end of the ribbon about 1.5″ from each edge – making sure the length of the ribbon is sandwich between the fabric (see picture). Do the same for the other side. Lay the “inside” piece right side down. Make sure the bed portion is lined up with the “back” of the house. Pin the ribbon straps in place and pin around the edges of the house. Starting on one of the back sides of the house, stitch around the entire edge of the house, leaving a 3″ hole for turning. Turn and then iron around all edges. 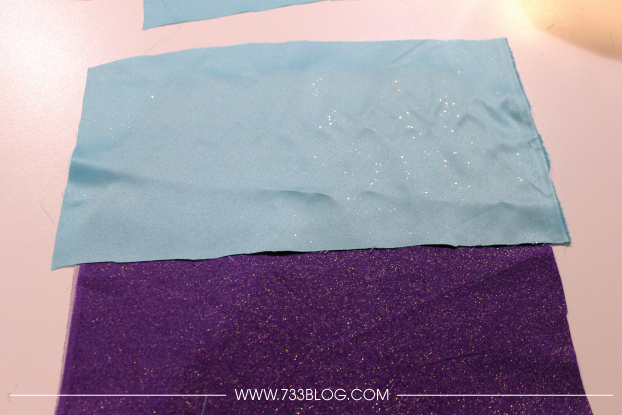 If you are using fabric paint to create the front of the house, do so now. Make sure to insert a piece of paper through your turning hole and place it behind where you plan on painting so it doesn’t leak through to the “inside” fabric. Once done and dry, remove the paper. 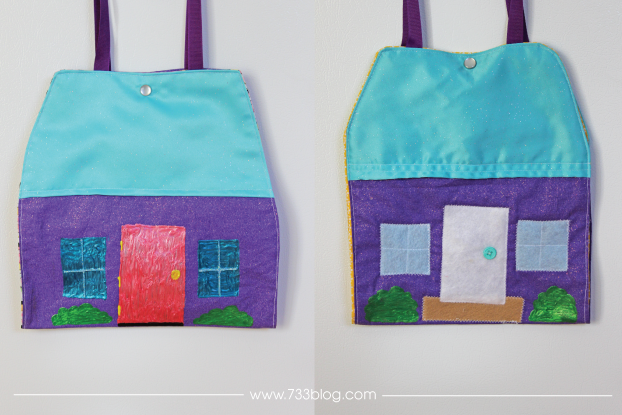 Top sew around the entire house. Add a snap or velcro at the top for closing and you’re done! I would love to see you’re completed project! Share it with me on Facebook, Twitter or Instagram, make sure to use my hash tag #733blog. Thank you and bless you and your creativity, and sharing. I’m in love with this project! 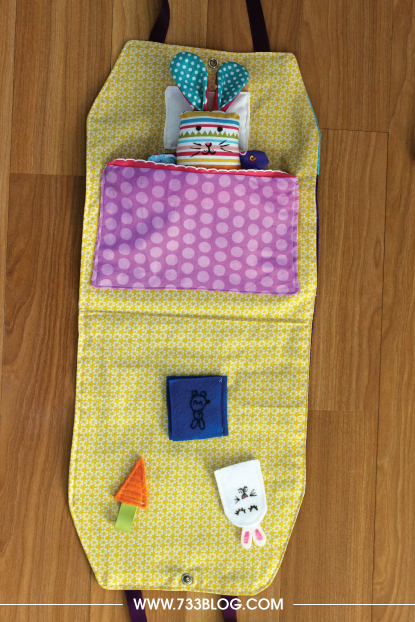 Such a cute gift – my niece cannot eat chocolate – she’d love this! It’s fabulous !! And so is the bunny ! Thanks for the tutorial ! It’s such a nice idea for a gift.